Whilst I love all Christmas cards - I'll always have a soft spot for the traditional! The "poinsettias" are made with an Eastern Medallions die and the Blossom Builder Punch with centres of Gold Faceted Gems. I used the Holly Berry Happiness stamp set for the holly and cut it out with the coordinating Holly Builder Punch to fill the corner and inked up the Labels to Love greeting with Stampin' Write Markers then used the coordinating Everyday Label punch to cut it out. The base card is Real Red with a layer of Pear Pizzazz. So that brings us to the decorative layer. 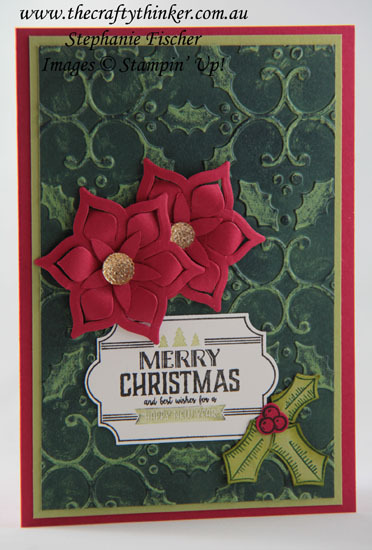 I embossed a piece of Pear Pizzazz cardstock with the Holly Embossing Folder. Leaving it in position in the folder, I ran a white wax crayon over the raised areas. I then swiped a Tranquil Tide ink pad over the piece. The wax resists the ink. On Wednesday I'll share a variant of this card with more contemporary colours.